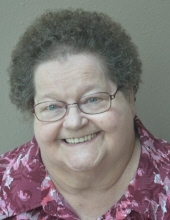 Sharon Lee Kersting, 77, of Pigeon Falls, WI (formerly of Northfield, WI) passed away on February 4, 2019 at Pigeon Falls Health Care Center. She was born on March 9, 1941 in Kenosha, WI, daughter of Melvin and Mary (Salo) Sockness. Sharon grew up in Kenosha, WI and retired in Northfield, WI. She married Harry Kersting in May 1959 in Kenosha, WI. She was an avid quilter and enjoyed being a member of Upper Pigeon Creek Lutheran Church, where she was also a Ladie’s Aid. Sharon is survived by her children, Gary (Deanise) Kersting and Susan Thompson; grandchildren, Douglas Marshall, David Kersting, Julie (Justin) Kersting-Keberlein, Mason Thompson; great grandchildren, Michael Kersting-Stark and Walter Kersting-Keberlein. She is preceded in death by her parents, Melvin and Mary; husband, Harry Kersting; siblings, Bernice Bell, Louise Rudan, Beverly Markee, Melvin (Sonny) Sockness; and granddaughter, Amy Kersting. Funeral services will be held 3:00 p.m., Sunday, February 10, 2019 at Jensen-Modjeski Funeral Home (128 South Hoffman Street, Hixton, WI) with Pastor David Christianson officiating. "Email Address" would like to share the life celebration of Sharon Lee Kersting. Click on the "link" to go to share a favorite memory or leave a condolence message for the family.